Thankful for Cold Weather in the Winter. Wait, did I say that? Everyone who knows me, knows I vastly prefer warm weather days. I love days when I can drive around with the top of my car down — I even wrote a 30 days of thanks post about how awesome fresh air days are. So why would I give thanks for cold weather days? Especially when I am enjoying 60 degree temps? One reason comes to mind immediately! Overwintering insects! I can remember a time when I didn’t even know what overwintering insects would be. Sure the terms make sense together, but at one point in my life, I lived in an entomologist-free world. Yes, I am sure LOTS of my friends are still there. LOL! Why do I care about overwintering bugs? When I lived in the Mississippi Delta, I learned about overwintering. I learned the hard way. Mosquitoes there have people VASTLY outnumbered. On a year with a cold winter, where you would have a week or two of below freezing temps, the mosquito populations would take a hit. 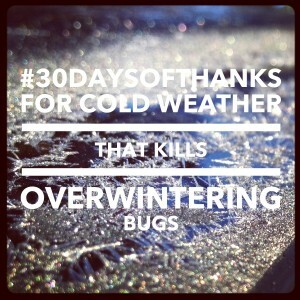 Yes, a long time of really cold weather is Mother Nature’s way of controlling bugs! I really hated the warm winters when even in January you could get bitten by mosquitoes! There are some pretty wicked bugs on the farm that get cut down in numbers during cold winters too. The one that is near and dear — or maybe fills me with fear? — to my love of cotton is the boll weevil. What a wicked bug that is. Farmers have long tried to limit the habitat where these dastardly bugs could overwinter. And granted that is less of a problem since eradication programs have been so successful, but it still takes diligence. And corn borers are another bad one. So while I personally would prefer to have warm winter, the reality is some cold time is better long-term. So, I will try to remember why I am thankful for cold weather when I have to pull out those Uggs! LOL! That is definitely contrary to my nature as a Southerner but it is something I know I need for sure! 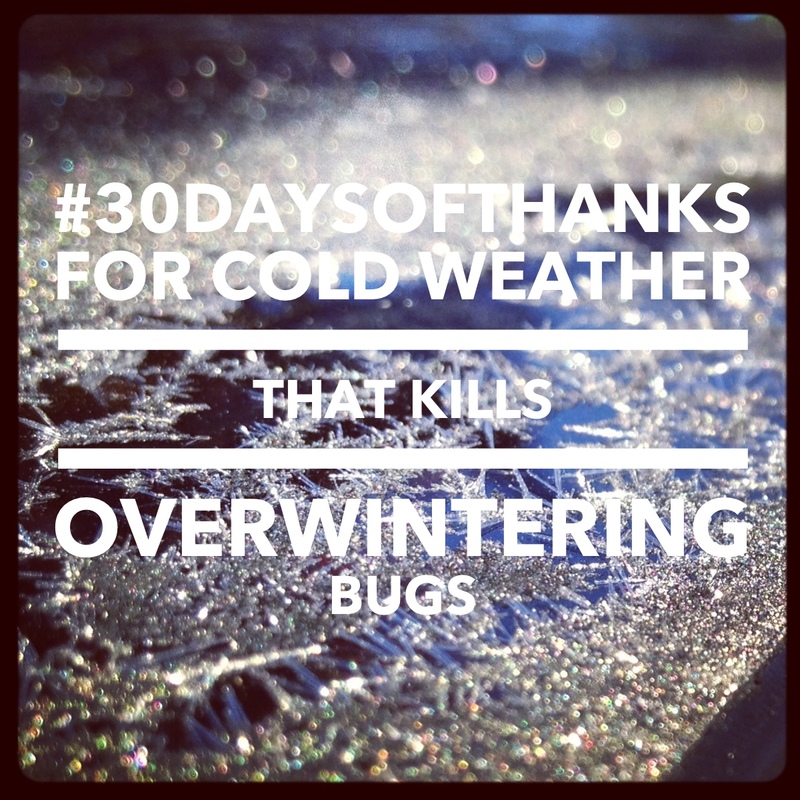 I had never heard of overwintering insects so it was interesting to find out about them. it’s a good reason to be happy about the colder weather. I need a lot of positive thinking to get me ok with the cold! I really prefer warm sun! LOL!